(U//FOUO) The FBI San Antonio Division recently reported that groups of young individuals in Texas, and possibly other states, were attempting to elicit information regarding residences of firefighters, military personnel, police officers, etc. The subjects knocked on neighborhood doors, telling residents they worked for an organization that helps young people with public speaking by sending them out to contact random people at their homes and ask about their professions. The youths reportedly received points based on the professions they located, with the potential of winning a college scholarship and a large sum of money. Police officer had the highest point value. (U//FOUO) The individuals had cards indicating that constitutional law permitted this activity, they were not required to show any identification (they did not carry state-issued identification), and they could not be restricted from their duties by state or local officials. This is consistent with sovereign citizen terminology. July 25, 2013: An identified and self-professed sovereign citizen, upset with a Superior Court judge regarding a delinquency notice for court penalties, told a probation officer he would not pay the fines and would harm the judge. The caller indicated he knew where the judge and his family lived. February 5, 2013: An identified subject sent the Middlesex County Board of Chosen Freeholders a letter that made some alarming and somewhat threatening statements and comments regarding his right to bear arms. (U//FOUO) The NJ ROIC currently has no information that individuals in New Jersey are soliciting information regarding the residences of government personnel. The NJ ROIC reminds government personnel to maintain the operational security of their personal information. (U//FOUO) Generally, subjects who make threatening statements do not conduct attacks, and subjects who conduct actual attacks do not make threats. However, law enforcement personnel must take such statements seriously and investigate them fully. The NJ ROIC currently has no indication of any pattern or trend associated with the threats, but provides this information for situational awareness. Secure or shred documents with personal information, such as your home address. Do not give personal or security-related information to strangers, including over the telephone. Use caution in sending sensitive information to unsecure or unofficial email systems. Avoid transmitting sensitive personal information such as passwords and credit card numbers when using unfamiliar or publicly available wireless hotspots. On forms or applications, omit any information that is not explicitly required. Information from surveys, sweepstakes, and applications may be sold and become publicly available. Treat any information on social networking websites as though it is publicly available information. Do not post personal or sensitive information or photos and use appropriate security settings. 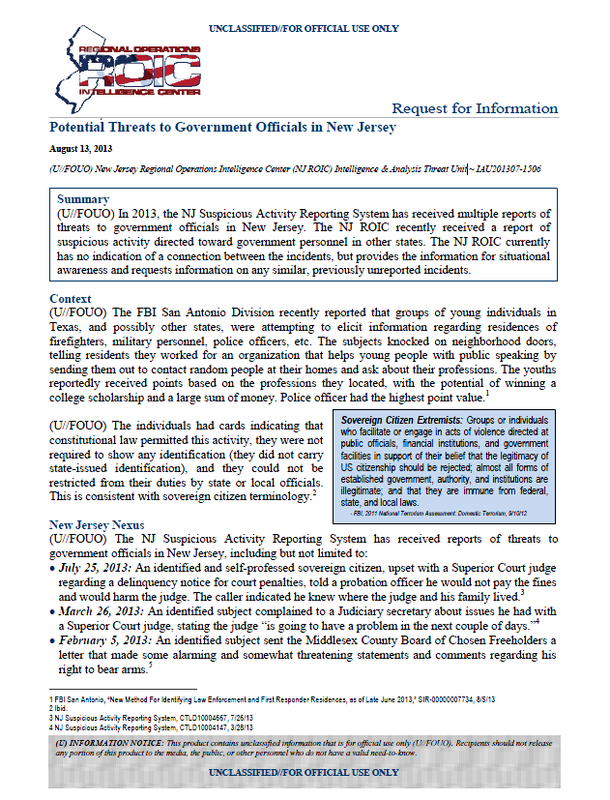 Report suspicious activity to local law enforcement, supervisors, and the NJ ROIC. (U//FOUO) The NJ ROIC Intelligence & Analysis Threat Unit is requesting any information regarding potential threats to government officials in New Jersey. The NJ ROIC also requests information regarding incidents of individuals soliciting information regarding the residences of government personnel. Suspicious activity should be reported immediately, per existing protocols. Activity can also be reported 24 hours a day to the NJ ROIC Counter Terrorism Watch at (866) 4-SAFE-NJ (866-472-3365) or tips@njhomelandsecurity.gov.